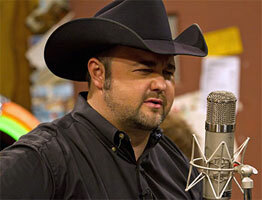 Chanteur Country US né Daryle Bruce Singletary, le 10 Mars 1971 à Wigham (Georgie). Daryle Singletary est mort le 12 Février 2018 à Lebanon (Tennessee). Neo-traditionalist singer Daryle Singletary was among the brightest new stars to arrive on the contemporary country scene of the mid-'90s, winning fans with his simple, honest songcraft and distinctively gravelly Vocalss. Born and raised in Cairo, GA, he grew up singing gospel alongside his cousins and brother, and while attending high school enrolled in a variety of Vocals classes; after graduation, he worked at a tractor dealership before relocating to Nashville to pursue a career in music. In Music City, Singletary frequently shared open-mike stages and amateur showcases alongside fellow up-and-comers like Tracy Lawrence and Tim McGraw; he eventually found work as a demo singer, recording the track "Old Pair of Shoes" for an independent label. The song made its way to Randy Travis, who decided to record it himself while recommending Singletary to his management team. 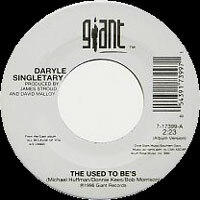 In short time, Singletary signed to Giant Records, and in 1995 he released his self-titled debut LP, scoring the smash hit singles "I Let Her Lie" and "Too Much Fun." The follow-up, All Because of You, appeared in late 1996 and generated the hit "Amen Kind of Love." Singletary's third album, Ain't It the Truth, was released in early 1998, followed by That's Why I Sing This Way on Audium Records in 2002. It would be five years before his next release, Straight from the Heart, appeared in 2007 from Shanachie Records. Rockin' in the Country was released by Koch Records in 2009. After a six-year hiatus from recording -- he still performed live in the interim -- Singletary returned in 2015 with There's Still a Little Country Left. In the summer of 2017 he released American Grandstand, a duets album with Rhonda Vincent. Daryle Singletary died unexpectedly at his home in Lebanon, Tennessee on February 12, 2018. He was 46 years old. 03/1995 SP GIANT 7-17902 (US) . 04/1996 SP GIANT 7-17650 (US) . 03/1997 SP GIANT 7-17399 (US) . 07/1998 SP GIANT 7-17172 (US) . 1998 CD GIANT PRO-CD-9367-R (US) (promo) .